A few weeks ago, I was attempting to clean up my storage locker when I pulled out some papers that I printed dating back to the mid-1990s. One of them was a bus route guide for Vancouver that I typed myself and have continued to update. Anyone remember the 23 New West Station/Stanley Park? Or the 226 St Patricks/Lonsdale Quay? Those routes existed in 1997! That's right. 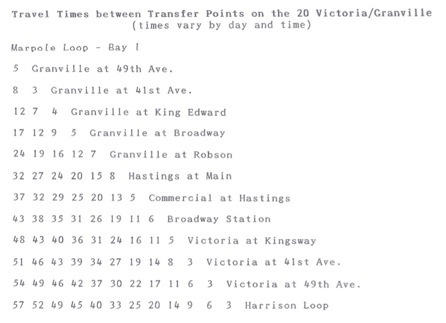 The 20 Victoria/Granville. Then, as now, I still rely on public transit as my primary mode of transportation (even more so now because I decided not to renew the insurance on my car). But to me, it’s much more than that. As evidenced by the documents I produced a decade ago, I have been, and still am, a proud transit geek. In the 20 years I’ve lived in Vancouver, I’ve pretty much covered every regular route in the BC Transit/TransLink region. It started in high school, when in the years before getting a driver’s license, it was the only way for me to get around on my own. Since then, I have explored the limits of the system map, from Horseshoe Bay to Aldergrove, from Steveston to Ruskin. And only earlier this year did I bring my travels to the central Fraser Valley by taking West Coast Express all the way to Mission and returning to Vancouver via Abbotsford, if only to prove that it is possible to do it. 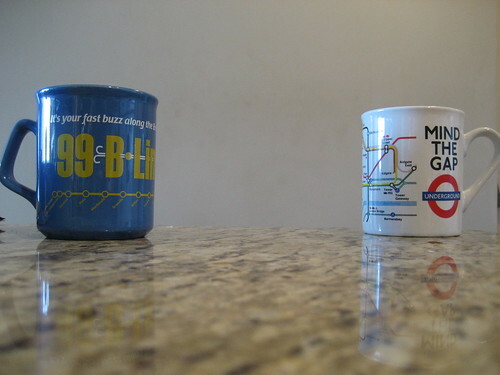 I’ve also been a pack-rat with some transit paraphernalia. I used to compile all the strip transfers and use them as kindling for summertime campfires. Pens and vehicle cutouts were among other items that I’ve collected. However, timetables and maps form the biggest part of my collection. From the old days of individual timetables for Vancouver routes, to those documenting the before and after of major changes in the system, I’ve managed to keep some of them. I’ve even taken my transit enthusiasm abroad. Be it Montreal, Portland, Belfast (which is part of Northern Ireland’s Translink network), or even car-crazed Los Angeles, I’ve used public transport in those cities and many others. In some places, there are aspects of public transit that are tourist icons in themselves, like London’s double-decker buses or San Francisco’s cable cars. And I’ve kept the transfers, timetables or maps for some of the routes I used too! What I was hoping to convey here is that I have an affinity to public transport that goes beyond that of the regular commuter. Thanks to the power of the internet generally, and of the Buzzer Blog in particular, I’m glad that I’m not alone. So as I Love Transit week begins here in Vancouver, I’d like to invite you to bring out that inner transit geek and celebrate the awesomeness of the public transport experience!